The City of Sydney (that’s in Australia!) recently received a delivery of 10 Nissan Leaf electric cars. The Nissan Leafs will be used by Sydney’s city employees, health and building inspectors, city planners, and engineers to get around. To date this is the largest order of Nissan Leafs in Australia. “The zero emissions technology, alternate fuel technology is here to stay and we are at the leading forefront of it. This represents not only our vision but the visions of other municipalities seeing the way we do it and trying to provide for a better future.” said William F. Peffer Jr., Managing Director and CEO of Nissan Australia who handled the deliver of the Nissan Leafs to Sydney’s Mayor, Clover Moore. 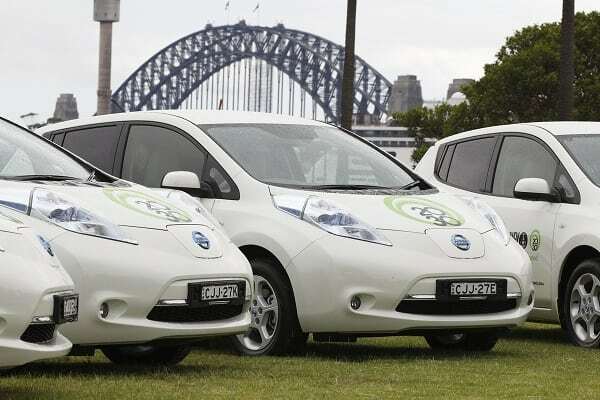 The Nissan Leaf order replaces Sydney’s fleet of 10 Toyota Prius gas-electric hybrid cars. “The advantage of a car like this is, in terms of parking, it’s a real issue in the city [Sydney], and reducing congestion. Congestion is currently costing us $4 billion [Australian Dollars] (equivalent to $4.1 billion) a year, so we have to look at every possible way of reducing it,” said Sydney’s Mayor, Clover Moore. Sydney hasn’t just bought the all electric Nissan Leafs without thinking about charging infrastructure though. The city has 7 electric charging stations at its public parking stations in Kings Cross and Goulburn Street. The Nissan Leaf’s 24kWh lithium-ion battery can be recharged in roughly 7-8 hours using a standard charger. With a quick charger the Nissan Leaf can be charged in about 30 minutes. A trickle charger can replenish the lithium-ion battery in 16 hours. You often hear electric vehicle skeptics say, “The electricity used to charge electric cars is carbon based.” What’s cool is that Sydney has thought about that. The carbon emissions from charging the Nissan Leafs will be offset by electricity produced by solar panels installed on city buildings. Sydney is in the process of outfitting 5,500 solar panels on 30 of its city buildings. This includes the Town Hall House, Sydney public buildings, and major depots all around Sydney. This is the largest building-mounted solar installation in Australia. Since Sydney has been leading the charge with such great green initiatives and reducing greenhouse gas emissions, Sydney received certification as a carbon-neutral city from the National Carbon Offset Standard in November 2011. Sydney is not the only city to that is taking to the all electric Nissan Leaf. Mexico City has had 70 Nissan Leaf taxis driving around as part of a pilot program. There are also 50 other Nissan Leaf taxis in the Mexican state of Aguascalientes. The Nissan Leaf recently became the best selling electric car of all time. Worldwide Nissan has sold over 50,000 Nissan Leafs since launching back in December of 2010. It’s great to see the Nissan Leaf being well received in Australia and all over the world. We hope to see more electric cars driving around everywhere.